Sub:- AP SE Dept. - RMSA - District Level Inspection & Monitoring Visits of Schemes under Integrated RMSA - Constitution of two (02) committees - Orders - Issued - Req. The attention of District Educational Officers & District Project Coordinators of RMSA of the State are invited to the subject read above and are hereby Informed Girls Hostels, Self Defense Training Programme and Vocational Education Scheme are is in the State from the year 2016-17 as part of implementation of Integrated RMSA Scheme in the State. Accordingly, funds have been released under said schemes towards functioning of Girls Hostels i.e., providing amenities to the boarders, conduct of Self Defense to the Girl Students and for purchase of adhoc toots under Vocational Education etc., for smooth implementation of Integrated RMSA Scheme in the State. 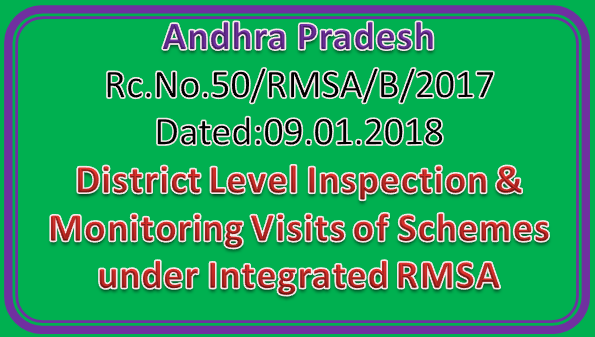 In this connection, it is brought to the notice of this office though funds are being released as and when needed under said schemes, there exist certain problems for not utilising the funds properly of the concerned component of Schemes which are to be streamlined immediately for smooth implementation of Integrated RMSA Scheme in the State. In view of the above, the above two Committees are requested to conduct inspection and monitor the functioning of Girls Hostels and implementation of Self Defense Training to Girl Students and Vocational Education in the State monthly once on or before of every month and submit compliance before the end of same month to this office for taking further necessary action.